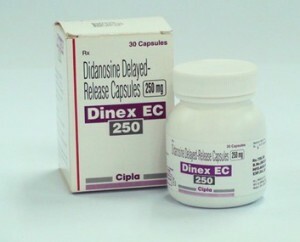 Didanosine An antiviral agent, a nucleoside reverse transcriptase inhibitor, a synthetic analogue of deoxyadenosine (purine nucleoside). Active against HIV. After penetration into the cell didanosine metabolized by cellular enzymes to the active metabolite – dideoksiadenozina triphosphate, which inhibits HIV reverse transcriptase. Under the influence of didanosine increased number of cells with CD4 + receptors, which is considered confirmation of the antiviral action. Simultaneously normalize the peripheral blood and the content of viral protein (antigen P24) in the blood.